Art: Create a fish print t-shirt using a real fish! Used with 1st-6th grade. (Carol's all-time favorite art workshop!) Scroll down - there are pictures. Cooking: Make fish-shaped pretzels. Used with 4th-6th grade. Games: Learn story details; play a quiz game using the game wheel & the room-sized game board. Used with 4th-6th grade. Drama: Learn story details by enacting the story. Used with 1st-3rd grade. Video: View portions of the animated video, Nest Entertainment’s Bread from Heaven. Used with 1st-3rd grade. Name that the story is found in the New Testament in all four Gospels; identify the four Gospels. For 3rd grade and up: Locate the story in the Gospel of John. Re-tell the story in his/her own words. Define a miracle as an amazing event that tells us something about God. The miracle of the feeding of the five thousand is the only miracle of Jesus (except Jesus’ resurrection) that is recorded in all four Gospels. As with stories that are covered in multiple sources there are slight differences between the various Gospels. However all four agree on important points: the number of loaves and fishes (five and two, respectfully), the number of people present (5,000 men), and the number of leftover baskets (12). When it gets to be dinnertime, some of the disciples felt disappointed that Jesus didn’t send the crowd away; people were probably becoming restless and hungry. (Matthew 14:15, Mark 6:36) In John’s Gospel Jesus appears to test Philip by asking him about where to buy bread for the people to eat. Jesus must have known another miracle was going to occur. A miracle can be described as a moment when, as a result of an unexpected and surprising event, one becomes aware of the presence and power of God at work. More simply, a miracle is a wonderful event that teaches us something about God. Jesus performed many miracles. He healed the sick, cured the lame, calmed a storm, and brought the dead back to life (to name a few). Jesus’ miracles certainly must have amazed those who witnessed them. A meager lunch becomes enough for leftovers! To stage his miracle Jesus had the people sit down. Mark 6:39 records that the people sat down in groups. Luke 9:14 reports that they sat in groups of about 50 each. Recall that when the Bible was written only men were counted. The total number of people present would have been much larger because surely there were also women and children there. When everyone had had enough to eat Jesus instructed the disciples to collect the leftovers. They gather 12 baskets of uneaten food – after everyone has eaten enough! Jesus wanted to teach a lesson about sharing. Sharing is significant even when we think that what little we have isn’t worth sharing. Doesn’t it make you wonder: what if the boy had withheld his lunch? Would Jesus not have been able to feed the multitudes? If we offer nothing to God, maybe he’ll have nothing to use? God can take what little we have to offer and turn it into something great (i.e., leftovers). A boy offers his lunch of five loaves of bread and two fish, and of course, the disciples think it can’t possibly help. (The third underlying lesson in the details of this miracle is appropriate to teach our children.) It was a young boy offering his lunch that ends up feeding over 5000+ people. This shows that age is not a limitation to service for God. Jesus needs what everyone can bring. What is the real miracle? Scholars have debated about what is the greater miracle in this story. Is it that Jesus multiplied the bread and fish, or that the people really did bring along a little lunch and ended up sharing it? As Doug Norris tells it: “Perhaps the little guy inspired others to share. Wouldn’t it be something if the miracle was a miracle of sharing, as people, one by one, pulled food out of their backpacks and shared with those around them. Perhaps Jesus walked through the crowd, encouraging, touching, blessing, visiting, and the stingy, the selfish, and the hoarders gradually warmed up, and realized their potential by not only sharing their food, but by experiencing the joy of doing something significant with and for Jesus.” What would our world look like if we all caught such a sharing attitude? A miracle happens – then what? An immediate result of this miracle is that the people realized what had happened. Now it is our duty to take this miracle and have it provide teaching for our hearts and minds. Alexander, Pat ed. The Lion Encyclopedia of the Bible. Batavia, IL: Lion Publishing, 1986. Coffman, James Burton. “Commentary on John 6.” Coffman Commentaries on the Old and New Testament. 1983-1999. Mays, James L. ed. Harper’s Bible Commentary. San Francisco: Harper & Row, 1988. Smith, Gail. “Knowing God by Obedient Faith: Jesus Feeds More Than 5,000 People.” 2005. Whitacre, Rodney A. The IVP New Testament Commentary Series: John. Downers Grove, IL: InterVarsity Press, 2002. This leads us to another question: What is the greater miracle in this story -- that Jesus multiplied the bread or that the people really did bring along a little lunch and ended up sharing it? Or is the miracle that on that day people, through his teaching and miracles, came to believe that Jesus Christ was the Messiah? Note: Many of these lessons were first used in 2002. Now that we are repeating this Rotation, we are posting additional workshops recently written, as well as changes to those written long ago. Reviewers Note: We know this sounds "gross" to some people, but a number of our members who have used this lesson have reported "the kids loved it!" For scripture, objectives, and background - see above. Place table covers on at least one table. For 4th-6th graders: Write the story out on the fish shapes (from John 6:1-14). Have one fish be the Bible reference. For 1st-3rd graders: using the pictures from the story, glue them onto the fish shapes. Put paper clips on the fish so they can be caught with the magnetic fishing poles. Place all the fish in the “pond.” Add a couple of blank fish. Flatten enough cereal boxes to have one per student. Ask: How many of you have ever been fishing? (Optional) Show the photo you’ve brought of a personal fishing expedition. Say: Lots of times when fishermen catch a big fish they like to take a photograph of it so that they have proof that they caught a large fish. 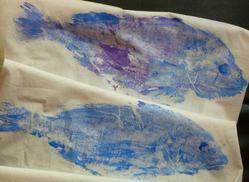 Say: Our art activity today will use a process called Gyotaku (pronounced gee-oh-TAH-koo). Long ago Gyotaku was a Japanese way of making a record of the size of a fish. We’ll see how this was done after we read our Bible story, which is about some fish. Say: Miracles in the Bible are amazing events that were totally unexpected. Today the miracle we’ll look at is that Jesus fed a lot of people with just a little bit of food. Miracles teach us something about God. [Refer to the easel for readers.] Let’s keep this question in mind as we go over our story: What does this miracle teach us about God? Say: We find the story of Jesus feeding multitudes of people in all four Gospels! This is the only miracle that is told in all four of the Gospels. We are going to read the version that isin the Gospel of John. Distribute Bibles. Have everyone find John, chapter 6, verse 1. If this is the first week in the Rotation, read the story to the students asking them to follow along, (John 6:1-14). Towards the end of the Rotation, ask the students if they can tell you the story. Have them check their Bibles for accuracy. Show the pictures as you read pages 320 – 328 in The Praise Bible. The class says: Thanks be to God! [Refer to the easel for readers.] What does this/these miracle(s) teach us about God? [Use the overview materials to guide discussion]. Say: I had mentioned that our art process was to use Gyotaku. Gyotaku is a Japanese word that literally means “fish rubbing” (gyo = fish, taku = rubbing). To remind us of this story about how Jesus fed over 5000 people with just two small fish and five loaves of bread, we are going to make fish rubbings or fish prints on t-shirts. Show them all the process on the first student’s shirt. Then let them work in groups of two to each make a print. While waiting to make a print, have them play the fishing game. Place the fish on a stack of half sheets of newspaper (you’ll be removing a sheet with each print). Stuff the shirt to be printed with a flattened cereal box. Make sure that the child’sname (first & last) and grade, is written on the dry cleaner hanger. Have the student brush a thin coat of fabric paint on the fish. (It really does not take much.) May choose to use all one color or more than one color. Make a light print of the fish using a sheet of blank newsprint (the paper before the news is printed) this takes off the excess paint from the fish. Discard this newsprint. Now slide the top sheet of newspaper out so that the surface beneath the fish is clean (otherwise you’ll get paint on the t-shirt in places where you don’t want it). Carefully lay the shirt over the fish (with the cereal box inside). Important: Where it lays is where it stays! (Don’t shift the shirt once it’s on the fish). Have the student gently rub the fabric of the shirt that is over the fish, with their hand. They will put their hand inside the shirt – the “sandwich” will be the fish, then the back of the shirt, then the child’s hand, then the cereal box then the front of the shirt (assuming a print is going on the back of a shirt.) Encourage the student to gently rub all parts of the fish with the shirt so there won't be any blank or faint spots on the shirt. Remember to rub all the fins, too. Take your time! The fabric may wrinkle a little bit, but that is all right just so long as the fabric doesn’t shift. After you have pressed the entire fish, carefully peel off the shirt with the cardboard inside. There is your fish print! Hang the shirt (may need to leave the cardboard inside until the paint dries). Optional, for older children: allow them to use other colors of paint to add highlights to their print – for example, speckles by applying paint using the pointed end of a paintbrush or to add white paint for an eye. For subsequent prints, return to step 4 and repeat. If a different color is desired, wipe the fish gently with paper towel between colors. Some mixing of colors will occur but this enhances the print. Gyotaku originated in Japan in the early 1800’s. Fishermen practiced it to preserve a record of their catches. (A fish print never lies, but fishermen do!) There are many Christians in Japan because someone shared the bread of life with them. In the story God needed the boy’s lunch in order for Jesus to work a miracle. Do you suppose that God might use you as part of a miracle? Back in the days when the church was just starting up (around 2000 years ago) people used the symbol of a fish to identify that they believed in Jesus. What message will it show to others when you wear this shirt? Have the children take turns using the fishing poles with magnets on them to catch a paper fish in the “pond”. Throw back any fish without a portion of the story on it – i.e., anything that’s not a fish! Have the kids try to arrange the verses (or story pictures) everyone catches, in the proper order. (One fish will have the Bible reference on it). Alternate activities are to do the provided puzzle pages. Mix up a set of story fish. Time the students in their putting the story fish in order. See if they improve their time with subsequent attempts. Say: Let’s close with prayer. Ask for any prayer requests. Ask if anyone would like to lead the group in prayer. Use the Lord’s Prayer as the ending. A suggestion: Jesus, Thank you for this opportunity to be creative today. Help us to remember when we wear our shirts that you turned a boy’s small lunch intoenough food for over 5000 people and that there were leftovers! (End with the Lord’s Prayer) Amen. Meyer, Nancy Jean. “Gyotaku: The Japanese Art of Fish Printing.” ARTSEDGE. Figure on the adults being squeamish about touching dead fish but the kids really got into this! It makes beautiful prints. Our preschool did fish printing on t-shirts last year so it can be done by all ages. If you choose to make prints on paper you'll need to use a very thin paper such as rice paper. Regular paper just will not work because it's too stiff. Ask your fish market to donate the fish. I found myself teaching a Bible story to the sales clerk at the store (you want it for what?). Pillsbury brand of bread sticks does not contain milk, eggs or nuts. Set the cups (at least 1 per student), napkins and sandwich bags out in the Social Hall. Cover cookie sheets with parchment paper. Separate one egg into white and yolk; discard yolk. Beat white with a fork. Gather everyone around the tables in the Social Hall. Greet your students warmly, welcoming them to the Cooking Workshop. Introduce yourself and any other adults. Have you ever been at a dinner for ten people? What kind of food did they have at your dinner for ten? Have you ever been at a dinner with 100 people? Say: Today we are learning about a miracle that Jesus did. This miracle involved food – bread and fish. Do you know what the miracle was? Say: Jesus was able to feed more than 5000 people with just five loaves of bread and two fish. Do you think that five loaves of bread and two fish are enough to feed more than 5000 hungry people? Say: To help us remember this story we are going to make fish-shaped pretzels. We are going to each be able to make two pretzels; one you may eat and one to share with someone else. We are going to do our baking first then while the pretzels are baking, we’ll talk about our story. Wash your hands first and then have everyone wash their hands. Offer aprons if kids want to wear one. Open the packages of bread stick dough; one package for every 6 students which makes 12 pretzels. Separate the dough into 12 sticks per package. Roll each individual stick of dough into a rope about 8-12 inches long. This can be done right on the metal tabletop. Shape each rope into a fish-shaped pretzel. Each child may make 2 pretzels. Explain how they may eat one pretzel and share the other one. Place the pretzels on parchment covered baking sheets. Brush with beaten egg white. Sprinkle lightly with salt. Have students wash their hands and return to the Social Hall. To time the pretzels and remove them from oven and allow them to cool on the cookie sheets. When the pretzels have cooled, have the Shepherd use a cart to bring the cookie sheets with a spatula to the Social Hall. What is the good news that we learn about from Jesus? Say: There is lots of good news in the Gospels: Jesus died on the cross to forgive our sins, Jesus has power over death because he rose from the dead to live again, and Jesus loves each one of us and wants us to believe in him. Say: We find the story of Jesus feeding multitudes of people in all four Gospels! This is the only miracle besides Jesus’ resurrection that is told in all four of the Gospels. We are going to read the version that is in the Gospel of John. Have everyone find John, chapter 6, verses 1-14. If this is a week early in the Rotation, you should read the scripture and have the students follow along. Towards the end of the Rotation, ask the students if they can tell you the story. Have them check their Bibles for accuracy. Remind the class that those are the words that are spoken in the worship service after the Bible is read. We say those words in class so that we will be used to saying them when we hear a Bible story read in the worship service. Say: It’s not so clear in the gospel of John, but when we read this story in the other Gospels we realize that the people had been listening to Jesus all day. Surely they were getting hungry. What do you think Jesus’ disciples thought when they saw only 2 fish and 5 loaves of bread to feed all those people? How do you think you would have felt if you had been one of the 5000 fed that day? Say: These stories show Jesus’ miracle-working power. This story we just read also shows that a boy shared his lunch, even though it was just a little, and Jesus was able to have it feed over 5000 people! If you had been one of the people there during this story, would you have shared your lunch? What do you think would have happened if the boy hadn’t brought a lunch or hadn’t shared it? Say: Jesus wants us to share what we have with others. When we ask God to bless what we have, we will be amazed at what can happen. God can take what little we have to share, and turn it into something bigger. Distribute a napkin, a cup and one pretzel to each child. Ask students to not start eating yet! Say: We have one pretzel that we are going to be able to eat (but not yet!) and one we will share with someone else. We will also be sharing our pretzel to eat with each other! We will do it in this manner: tear off a piece of pretzel and give it to someone else nearby. As you do, tell that person something God has given you. You may need to prime the pump with suggestions: a family, good friends, etc. Take up a pretzel yourself and share with a child something that God has given you. Say: Try to repeat this process with everyone in the class. When others give you a piece of bread, put it in your cup. Let’s all eat after everyone is done sharing. What were some of the responses you got as you shared your pretzels? Why do you suppose God provides so much for us? Say: Look at your cup. Sharing the pieces of our pretzels has made our cup seem fuller. As you eat your pretzel pieces think about all that God gives us because he loves us. Enjoy your pretzel pieces! Involve the kids in helping to clean up. Let wipe counters, put away supplies, put dirty dishes by the dishwasher, etc. Have students bag up an extra pretzel to share with someone. Tell them the must share the Bible story as well as the pretzel. Notes about this workshop: When we did this Rotation in 2002 we used the following recipe: "Bread Pretzels or Sticks" from the Joy of Cooking. Our cooking person mixed the dough up at home on Sunday morning. Punch down dough and divide into 12 pieces. Have kids work the dough with their hands to roll it into 18 inch lengths about as thick as a pencil. Loop it into fish-shapes. Boil a solution of 4 c. water and 5 tsp baking soda. (Don't use an aluminum pan). With a slotted spoon an adult lowers the pretzels into the water for about 1 minute or until they float. Put them on a greased baking sheet. (Parchment paper makes cleanup a lot easier - it is worth the cost!) Sprinkle with coarse salt (or with cinnamon sugar) and bake for 12 minutes. Made twelve 6-inch pretzels. Copyright 2008 First United Methodist Church, Ann Arbor, MI. Layout the life-size game board on the floor. Distribute Bibles in a circle around the game board. Cover the game wheel so it won’t distract the students during storytelling. Invite everyone to take their shoes off and have a seat on the floor around the game board. Greet your students warmly, welcoming them to the Games Workshop. Introduce yourself and any other adults. Say: Our Bible story today is about a young boy who was at an event with his lunch. We don’t know if it was his favorite lunch but it was a small lunch and he shared it. Let’s find our story in the Bible. Say: Our Bible story is one of the many miracles that Jesus did. Have them find the story in John, chapter 6, verses 1-14. Say: Jesus had taken a boat to cross the Sea of Galilee. He had wanted to find a quiet place to be by himself but, the crowds followed him. They knew that Jesus did great miracles. They wanted to see Jesus. I am going to start reading from the Bible at verse 5. Follow along if you’d like to do so. Read to them John 6:5-14. The students will be more familiar with the story. Have them locate the scripture in their Bibles. Then ask them to tell you the story. Fill in any missing details by using their Bibles. Read any portions that aren’t clear. Say: Jesus wanted people to believe in God. He didn’t do miracles just to wow the crowds or just so that people would follow him to see what he’d do next. Jesus used his miracles to teach about God. What does this miracle teach us about God? that age doesn’t matter – everyone can share. Explain that students will work in teams to move across the game board – squeezing onto spaces as needed. The object of the game is not to be first to reach the end, but for all teams to reach the end, or to get as far as time permits, and to have fun doing it. Please make sure everyone takes off his/her shoes. Ask the Shepherd to help you divide the class into teams of 2 or 3 players each. [Preferably in 2’s but 3 is ok if needed.] Have the team with the person whose birthday is closest to today’s date go first. One member of the team spins the wheel. While the wheel is spinning, ask the question of the team. All the people on a team should confer/work on an answer. Checking Bibles is OK! Remind the children that only the team in play should be talking. Take time for any discussion that occurs! If the team answers correctly they get to move to the color that was spun. Note: it is OK to start groups of kids from different ends of the game board. Have you discovered the features that are in these purple Bibles? Say: Look at the “Did You Know” note that is on the page where this story is told in the Gospel of Luke. Look up Luke 9, which is where Luke tells this story (page 1137). Say: Sharing and caring about other people is an important theme in this story. What do you have to offer to share with Jesus? Say: One way we can share is to give our time to support a mission. I would like to invite each of you to participate in a mission project. A group of women in this church, called the United Methodist Women or UMW, put together bean soup mix, which they then sell to raise money for missions. These missions help people around the world who are hungry and in need. There will be an event on a Friday night in November to help UMW put together bean soup mix that you can then help to sell. Share this idea of helping out with your family and plan to come if you are able. Give each student an invitation to come to this event. Mark & John start with Jesus crossing the sea. Matthew mentions why Jesus was going into retreat- he’d just heard about John the Baptist’s death. Luke identifies the town – Bethsaida. Luke talks about a concern for lodging & provisions. Luke has the people sitting in groups before being fed. Be sure to note where all four gospels agree: on the number fed (5000 men), the use of 5 loaves and 2 fish, and the number of baskets leftover (12). Game idea borrowed from an older game post by Gail Smith at rotation.org. Answers in bold. First ask the questions without giving any of the multiple-choice answers. Give answers if kids seem stumped. You may choose to vary the game rules – they can move forward to the color spun if they answer correctly without hints and they can only move forward one space if the hints are needed. 1. In what book of the Bible can we find this story? 2. Where does this story take place? 3. Why was there a big crowd of people there that day? 4. How many people were there that day? 6. What did Jesus say to Phillip? I’m hungry; let’s order pizza. Send the multitudes away, that they may go into the villages, and buy food. 7. What was Philip’s answer? They don't need to go away. You give them something to eat. 8. Why do you suppose that Jesus tested Philip? He liked to play games with his disciples. Jesus had told them that there would be a quiz. 9. Based on Philip’s response, how would you rate Philip’s faith? No one correct answer; probably pretty poor. Sounds like he’s trying hard. 10. Who volunteered to share their lunch? 11. The Gospel of John doesn’t tell us but the Gospel of Mark does – how did the disciples discover the boy’s lunch? They found it under a rock. It was in a large, red lunch box – couldn’t miss it. Mark 6:38 – Jesus asked the disciples how many loaves they had; Go see. Presumably they asked people. 12. Who else besides Philip doesn’t show much faith in this story? Andrew, by his response in John 6:9 – how will so little an amount of food help the situation. 13. How much lunch did the young boy share? 14. What did Jesus do to the boy’s small lunch? He distributed it and then remembered to say grace. The lame were healed and the blind saw. The blind saw and the sick were cured. Accept all of the above (if offered as the correct answer, plus) help the lunch fed over 5000. 16. What happened after everyone had eaten all they wanted? 17. Have you experienced (or has someone you know experienced) a situation where God stretched your resources beyond what would have normally been possible? 18. Why do you suppose there were leftovers? Accept all answers. Perhaps Jesus wanted us to see that when we shared a little, God could make a lot come of it. 19. When have you faced a difficult situation and been like Philip and Andrew – didn’t remember about your faith in Jesus? Permission to copy materials granted for non-commercial use provided credit is given and all cited references remain with this material. For when 3rd graders visit: In the Bible with tabs, bookmark John 6:1 and Luke 9. Greet your students warmly, welcoming them to the Drama Workshop. Introduce yourself and any other adults. Say: We are learning (continuing to learn) about the miracle of Jesus feeding a large crowd of people – it’s a story with lots of potential for drama. There’s a huge crowd of people, there’s the tension of everyone being hungry and only a small amount of fish and bread are available; we’ll get to act out what happens. Say: The Bible is divided into two sections, the Old Testament and the New Testament. Say: The Old Testament was the Bible that Jesus learned as a child. The New Testament tells us the story of Jesus’ life. Say: Besides being divided into two testaments, the Bible is further divided into books. Can anyone tell me how many books there are in the Bible? Say: There are 66 books in the Bible. Say: The word Gospel means “good news.” These first four books of the New Testament tell the story of the good news about Jesus’ birth, his life, and about the start of the church after Jesus’ death and resurrection. Say: Our Bible story today is one of the many miracles that Jesus did. Say: A miracle is an amazing event that can teach us something about God. Say: The story about the miracle we are studying today can be found in all four of the Gospels – each gospel telling the story a little differently. Say: When we are done reading our Bible story we are going to say what is said in church after the scripture is read. Be ready to say “thanks be to God!” when the scripture is finished. Say: Our Bible story today is found in the book of John. John is the fourth Gospel; remember the gospels are Matthew, Mark, Luke, and John. Read pages 298 - 302 in The Young Reader’s Bible. Show pictures as you read. On the third week of this lesson instead of reading the story, ask the students to tell you the story. Distribute Bibles. Have everyone find John 6:1-13. Make sure that everyone finds the verses. Enlist the Shepherd to help individuals. Remind them of the quick way to find the New Testament. You just received your Bibles in church. Have you discovered the features that are in this Bible? Say: Look at the “Did You Know” note that is on the page where this story is told in the Gospel of Luke. Look up Luke 9. Say: Jesus wanted people to believe in God. He didn’t do miracles just to wow the crowds or just so that people would follow him to see what he’d do next. Jesus used his miracles to teach about God – that God was powerful, and cared about people. Say: We said earlier that a miracle is an amazing event that can teach us something about God. Let’s act out our story and as we do, be thinking about what this miracle teaches you. Turn up the sound on the CD player. Don’t pass out scripts. The workshop leader serves as the narrator and the reader of all of the parts. As you read, pause where appropriate, to allow the students to “act” and adlib any dialogue. You may have to prompt the students to ad lib. It time allows, repeat with different actors playing different parts. Pass out copies of the script. Run through it. If time allows, repeat with different actors playing different parts. Say: A young boy shared his lunch and look what happened! Jesus wants us to share what we have with others. When we share what little we have, we will be amazed at what can happen. God can turn it into something bigger. Talk about our responsibility today for feeding the hungry. Ask: In what ways can we take seriously our discipleship and the fact that we are Jesus’ hands on earth today? Props: a large basket covered with a piece of cloth, inside of this basket is hidden smaller baskets also covered with cloths, a big box to use as a boat (optional). The Skit: Start off in the tent. Jesus is standing and the crowd is sitting around him. The two disciples are standing off to the side. NARRATOR: Jesus and his disciples had been teaching and healing in a large crowd of people. Finally Jesus signaled for his disciples. Jesus waved to his disciples to come. The disciples walk over to Jesus. JESUS: Let’s go to a quiet place on the other side of the lake. DISCIPLES: Ok Jesus. (signal to the crowd) Everyone, go home now. Jesus and his disciples climb into the boat. NARRATOR: Jesus and his disciples crossed the Sea of Galilee. The disciples make rowing motions and slowly move out of the tent towards the wall with the lake. NARRATOR: Meanwhile, the crowd figured out where Jesus was going. THE CROWD: He’s going across the lake. Let’s follow him. The crowd runs (or hops if their lame) in slow motion, going around the other side of the room, near the windows and approaching the lake wall. Jesus and the disciples get out of the boat. Everyone stays standing. NARRATOR: Jesus was not angry to see the crowd. In fact he continued to heal them. SOMEONE FROM THE CROWD: Jesus, Jesus! Heal me! JESUS: (puts his hand on the person) Bless you child, be healed! JESUS: Where can we buy bread to feed all these people? PHILIP: Eight months of my pay would not buy enough bread for everyone to have a bite! NARRATOR: The disciples went through the crowd looking for food. Give the covered basket to one of the children in the crowd. The disciples mingle among the crowd asking if anyone has food. Andrew finds one person who has the covered basket. ANDREW: This person has five loaves and two fish. But that’s not enough for this big crowd. NARRATOR: Jesus asked everyone to sit down in groups. Everyone except Jesus sits down. Jesus takes the basket. NARRATOR: Taking the five loaves and the two fish, Jesus looked up to heaven, and blessed and broke the loaves. Jesus gave the food to the crowd. Jesus looks upward and blesses the food. Then he opens the basket and gives a smaller basket to each disciple, who then act is if they are distributing food. The crowds pretend to eat. NARRATOR: Everyone had plenty to eat! And there were leftovers! JESUS: Gather up the leftovers, so that nothing is wasted. The disciples gather up leftovers from the crowd. PHILIP: Hey, Andrew, we started with just five loaves of bread and two fish. Did you notice how many baskets we had leftover!?! ANDREW: Yes! There were twelve baskets leftover! PHILIP: How many people are here? CROWD: Surely this is the Prophet who was to come into the world! Bruno, Bonnie and Carol Reinsma. The Young Reader’s Bible. Cincinnati, OH: Standard Publishing, 1998. Cartwright, Teryl et al. The Humongous Book of Bible Skits for Children’s Ministry. Loveland, CO: Group Publishing, 2006. Smith, Gail. “Jesus Feeds More Than 5,000 People: Art Workshop.” 2005. Refer to first post in this lesson set. DVD Reference: Bread From Heaven, Nest Family Entertainment, 2005. Using the Activity Book, make copies of pages 9 (the old man) and 23 (Jesus). Prepare snack. Pour cups of water. Make sure you know how to use the TV/DVD, especially how to move by chapters and scanning forward and backward within a chapter. Insert the DVD. Choose “Menu.” Choose “English Version.” Choose “Chapter Access.” And choose “Not Enough to Share.” When the words “Bread From Heaven” appear, press PAUSE. This is where this video will be started. Greet your students warmly, welcoming them to the video workshop. Introduce yourself and any other adults. Have you ever been at a dinner where there were ten people there? Say: Today we are going to watch a video of our Bible story. First let’s read the story in the Bible. Hold an Adventure Bible with tabs and review its organization. Say: The Bible is divided into two sections, the Old Testament and the New Testament. The New Testament is stories about Jesus. Besides being divided into two testaments, the Bible is further divided into books. Ask: Can anyone tell me the names of the first four books of the New Testament? Ask: The Bible is divided into two sections, what are they? Say: The two sections are the Old Testament and the New Testament. The New Testament is stories about Jesus. Besides being divided into two testaments, the Bible is further divided into books. Ask: What are the first four books of the New Testament? Say: The first four books of the New Testament are Matthew, Mark, Luke and John. We have a name for those first four books, what do we call them? Say: We call the first four books of the New Testament the Gospels. The word Gospel means “good news.” There is lots of good news in the Gospels. The best news is that Jesus loves each one of us and wants us to love him back. This is a trick question. In what Gospel do we find the story of our miracle? Say: We find the story of Jesus feeding multitudes of people in all four Gospels! This is the only miracle, besides Jesus’ resurrection, that is told in all four of the Gospels. Read them the story on pages 312 –317 of the Read With Me Bible. Show the pictures as you read the story. Alternately, in later weeks of the Rotation you may consider asking the students to tell you the story. Help them out by showing them the pictures in this story Bible. Distribute purple Adventure Bibles. Have them find the story in John 6:1-14. Say: Let’s take a look at what we are going to see in our video. This video starts off showing us a poor, hungry boy during Bible times. In the video he speaks with an old man. [Refer to the easel – old man picture.] Listen for what this old man says. Have the Shepherd distribute the snack. Say: Now watch what we learn about Jesus. [Refer to the easel.] And watch what happens to those five loaves of bread. Note to workshop leader: what to do if kids want to watch more of a video than the lesson calls for? Please don’t give in to their requests, unless you’ve finished the entire lesson and have extra time! Why? These lessons are specifically planned to get across certain teaching points. If you are spending time watching a part of the video that’s not a part of the lesson, you’re taking away from the intended teaching opportunities! What can you say to the kids? We’ll watch more of the video if we have time at the end of class. OR We should plan a family night activity here at church to watch the entire video! Thanks for following this lesson! What happened to the five loaves of bread? Say: Jesus did a miracle – he turned the boy’s five loaves of bread and two fish into a lot of food for lots of people. Say: A miracle can be described as a wonderful event that tells us something about God. Ask for any prayer requests. Ask if anyone would like to lead the group in prayer. Be prepared to say a prayer yourself, working in prayer requests. Use the Lord’s Prayer as the ending. A suggestion: “Dear God, Thank you for the stories in the Bible which teach us something about you. We have learned today that sharing is important. Help us remember to share even when we think we don’t have much to give. (End with the Lord’s Prayer) Amen." Choose “Adventure Quiz” and then Quiz Level 2, and then “New International Version” on the Scripture Translations page. Have the kids work together to answer the questions. They can ask for hints from the Bible or to watch a portion of the video again. Johnson, M. G. Ron. Bread From Heaven: Activity & Resource Book. Irving, TX: Nest Entertainment, 1996.